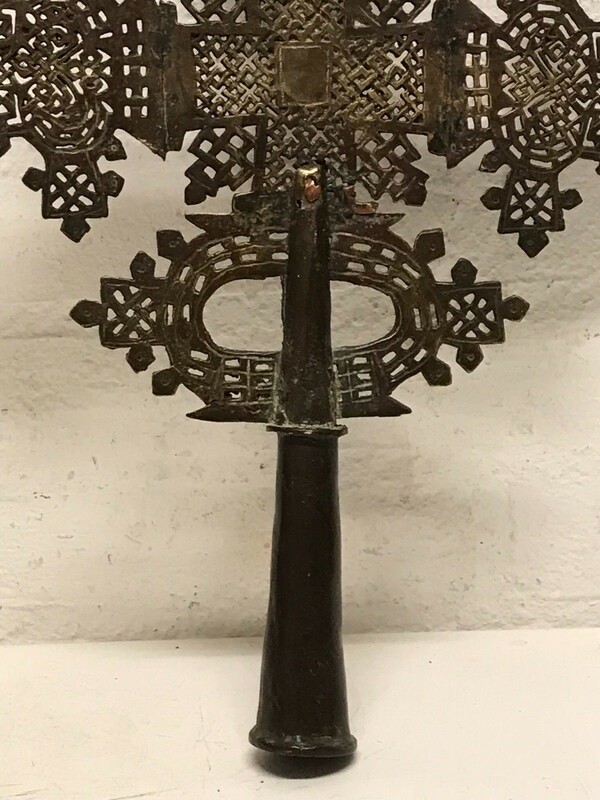 Ethiopian Procession- and hand crosses. 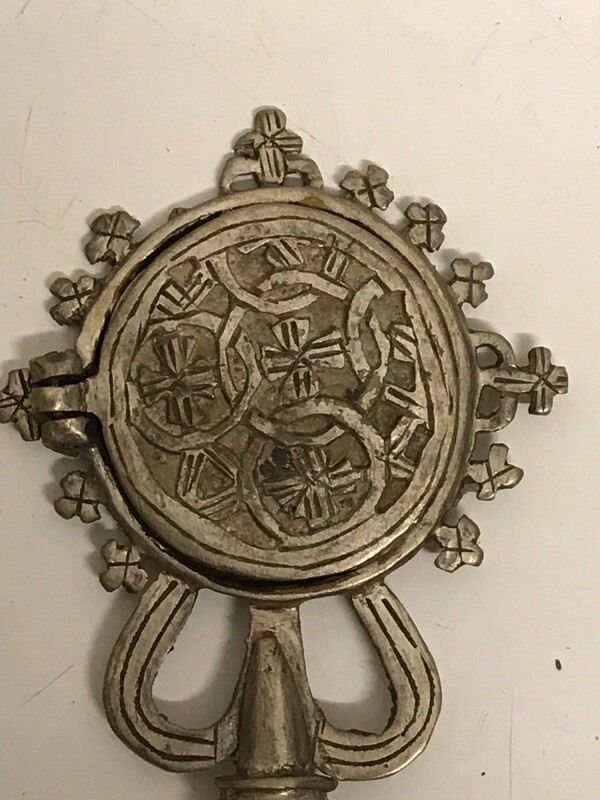 A large size silver processional Coptic cross with intricate designs and round base. 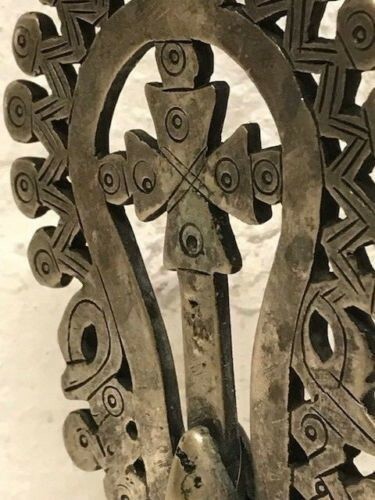 Crosses are among the most visual symbols, and evidence of Christianity in Ethiopia. 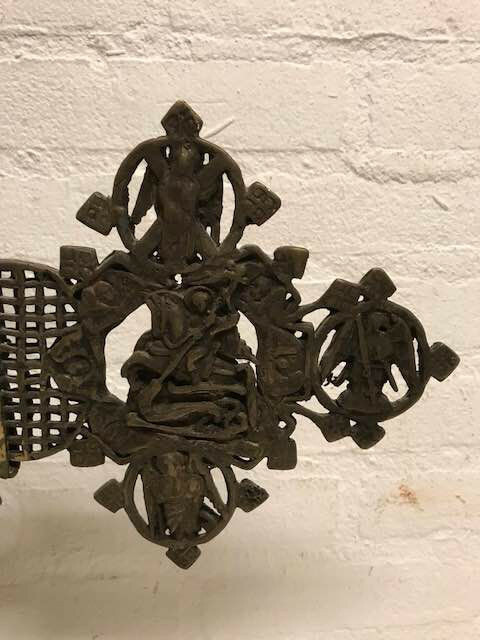 As a central religious motif the cross was made as a single piece or was associated with other visual arts. 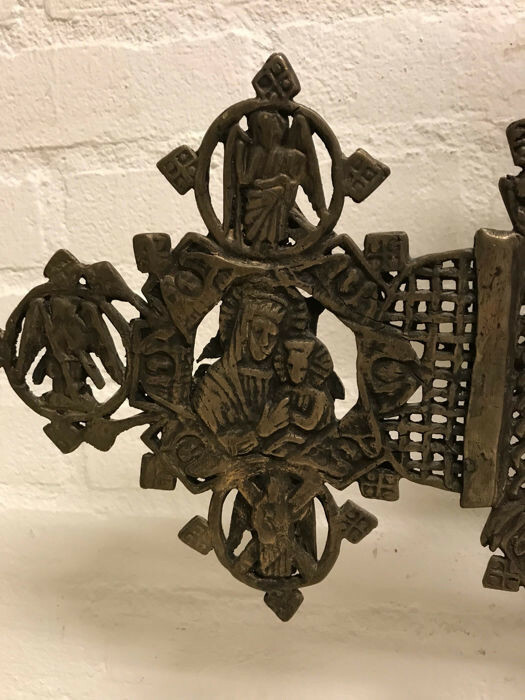 Individual crosses are cast or carved in different style, designs, and size. 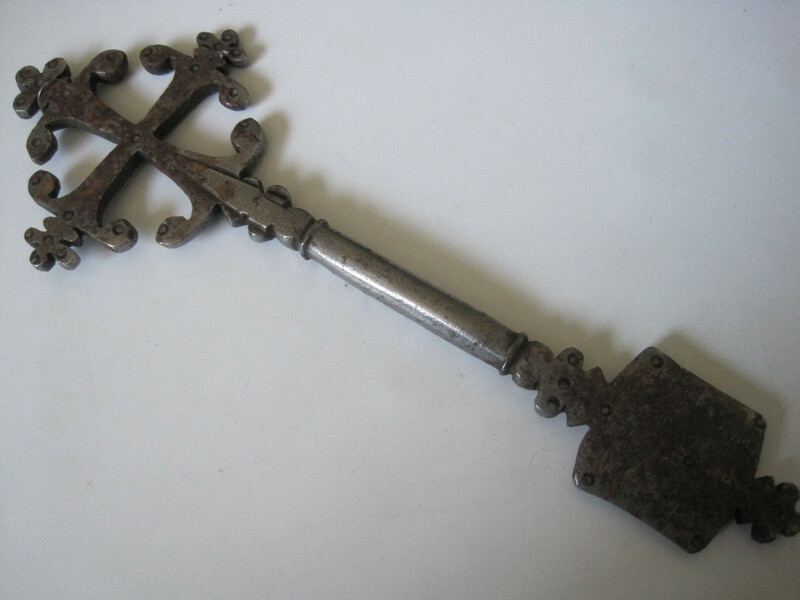 These are hand cut from various metal: silver, iron, gold, and brass and cast using the lost wax method. 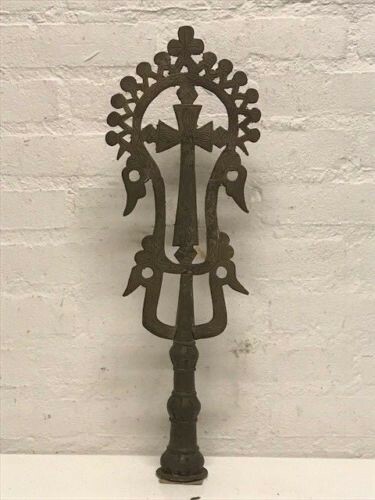 Ethiopian crosses are also made out of wood. 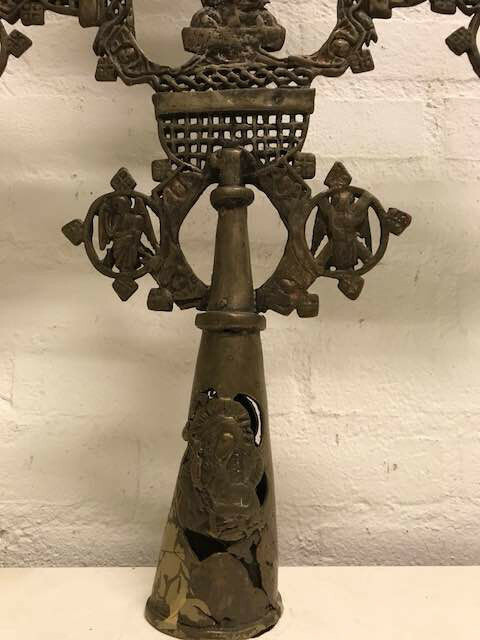 Designs are as varied as the regions and crosses are generally named after towns or provinces where they are made. 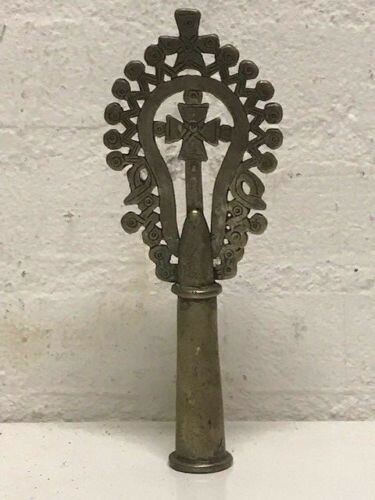 The use of these crosses is essentially religious. 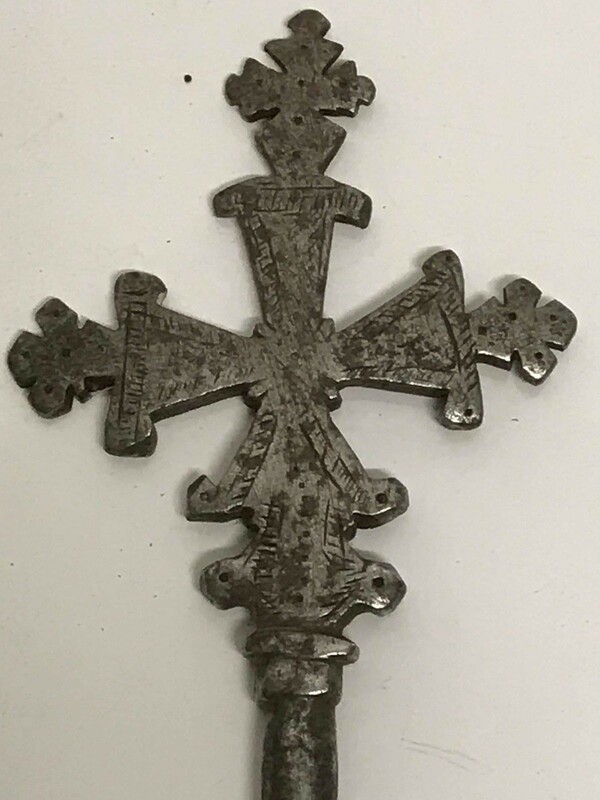 Small crosses are worn by men and women as pectoral or neck pendants. 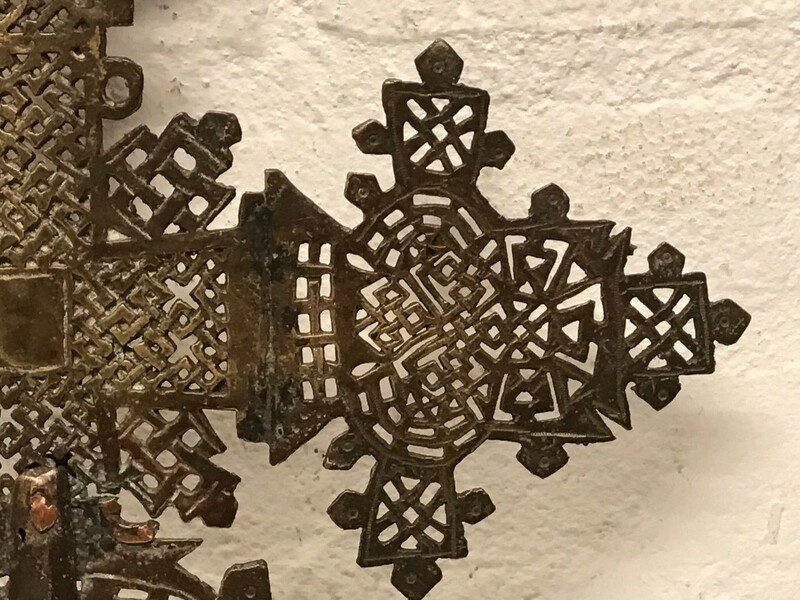 For more than 1600 years, Ethiopians have worn neck crosses. 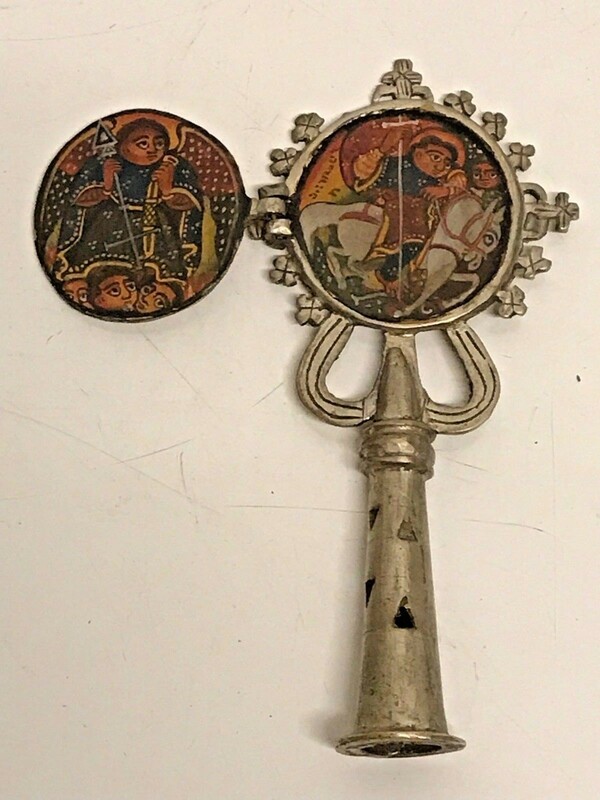 Most often, they are given at baptism and are worn as badges or symbols of their faith. 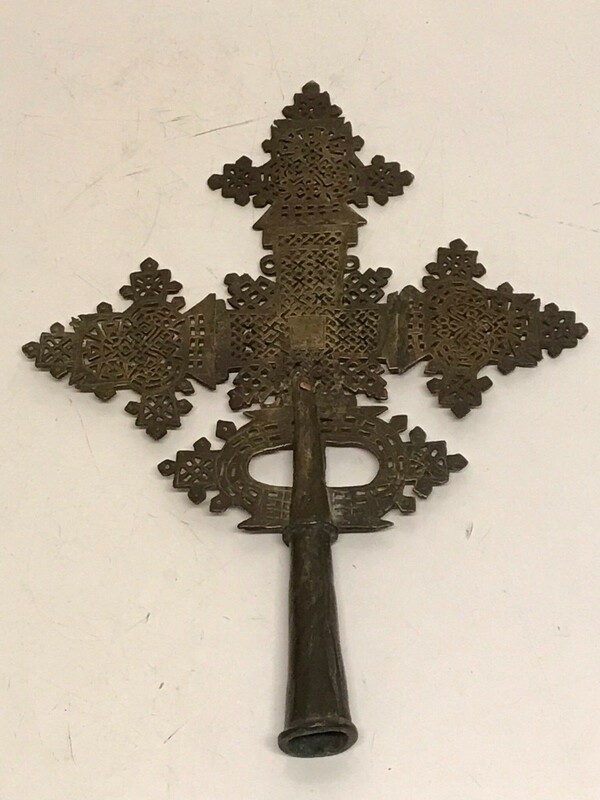 Large crosses such as this were used in church procession by priests during religious ceremonies. 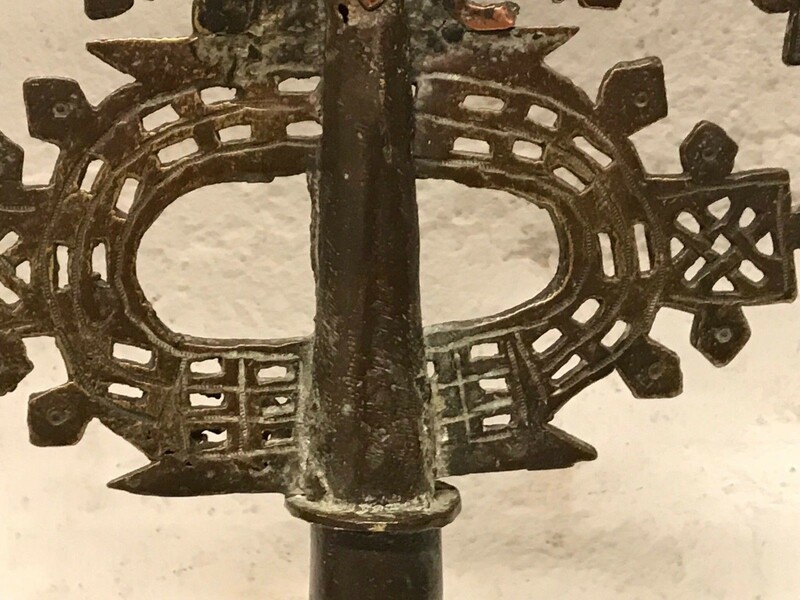 They were also held by pilgrims during processions. 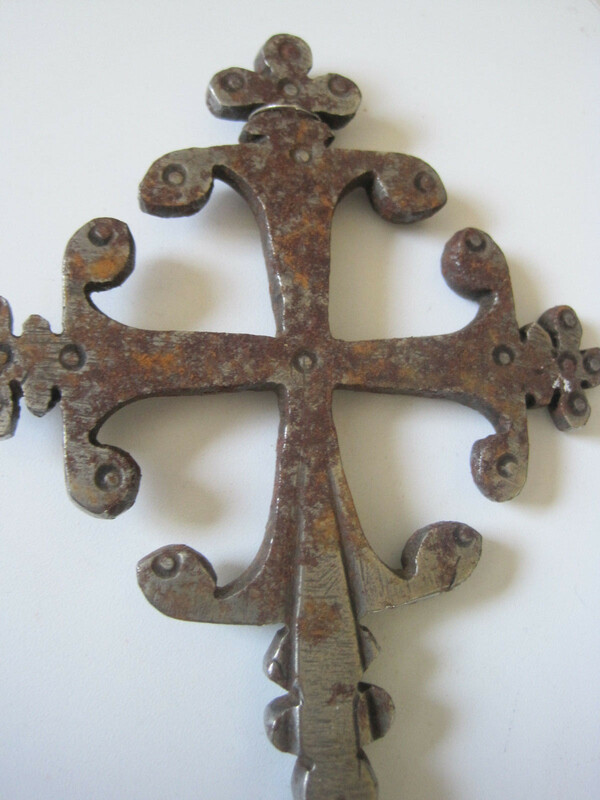 The most crosses are made of silver alloy. 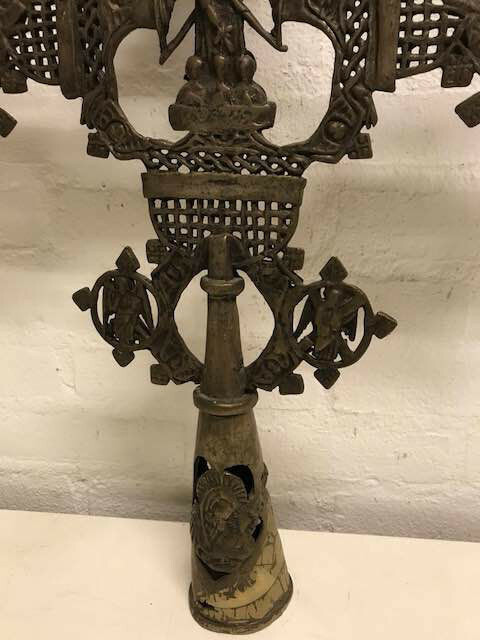 The hollow round base on this cross was used to mount the cross on a wooden pole in order to easily carry the cross during procession or to display it on altars. 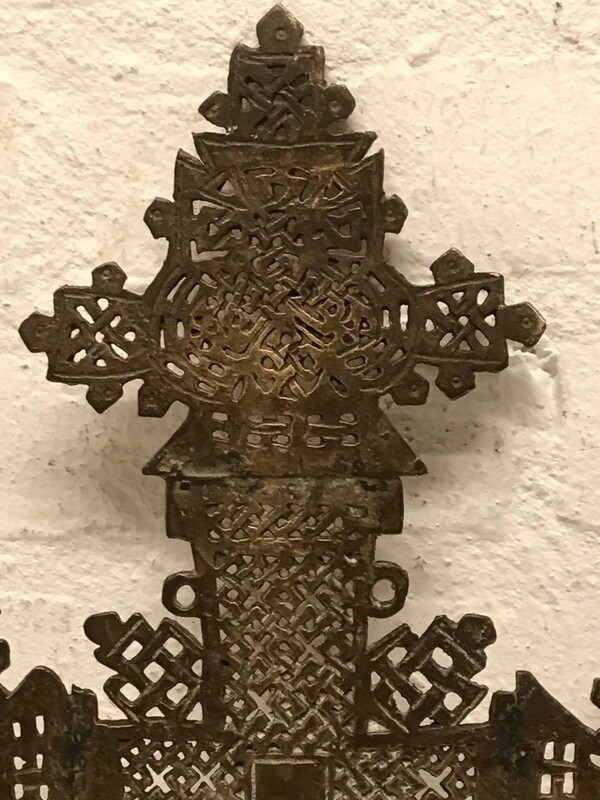 The intricate designs on this cross are the same on both sides. 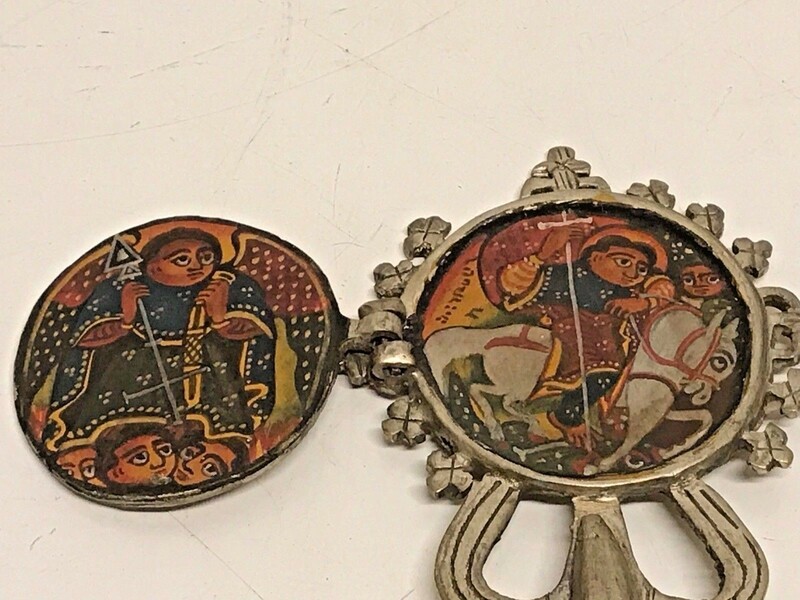 180656 - Antique end 19th Century Ethiopian Coptic procession Cross. 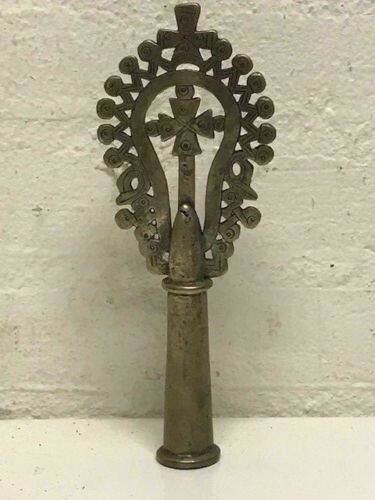 Antique end 19th century Ethiopia Coptic Procession Cross from the orthodox coptic Church. 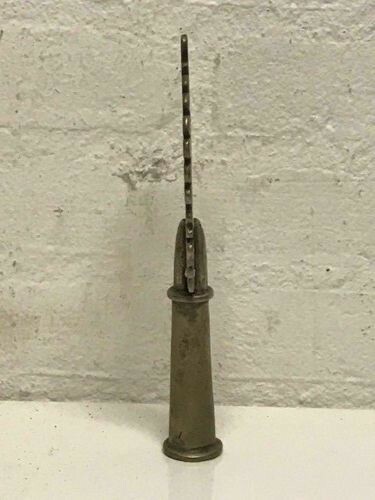 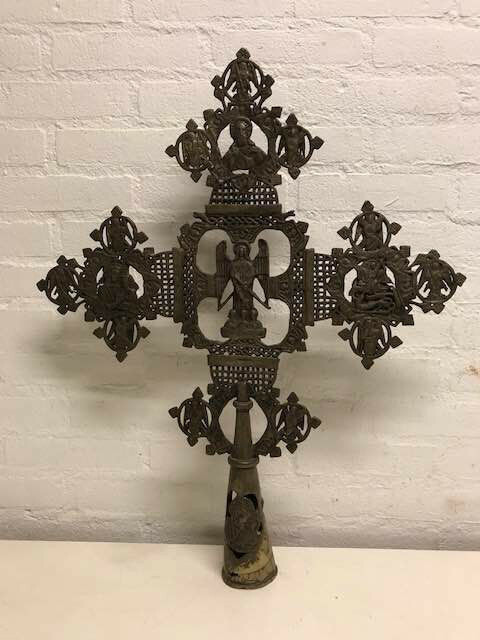 This iron cross measures approximately 31 cm high and is more then 100 years old. 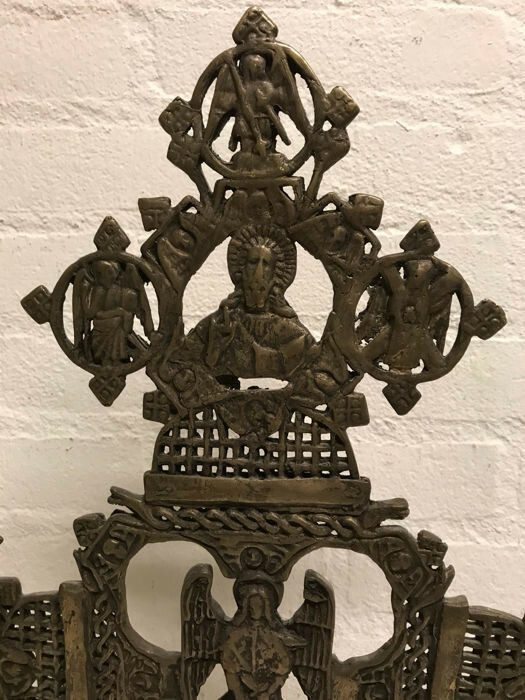 Ethiopia Coptic Icon altar Cross from the orthodox coptic Church in Axum. 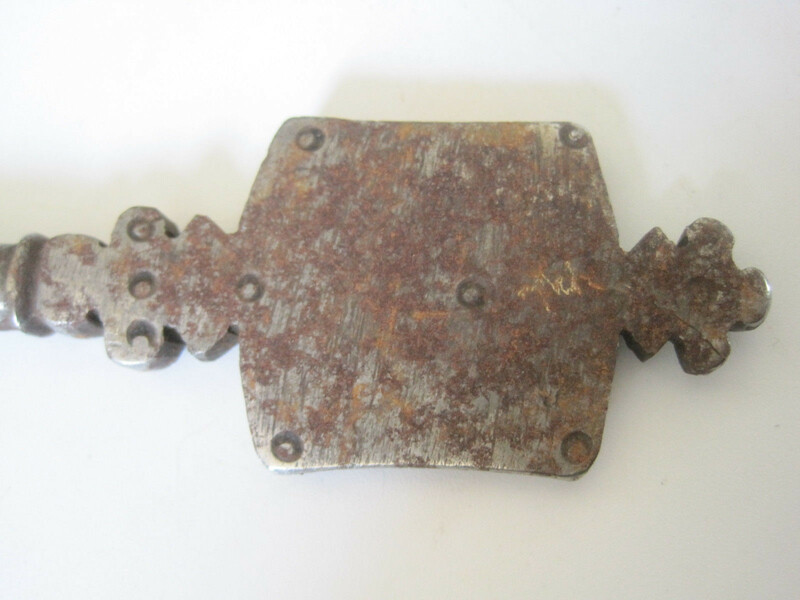 measures approximately 16.5 cm height and Wide: 8 cm. 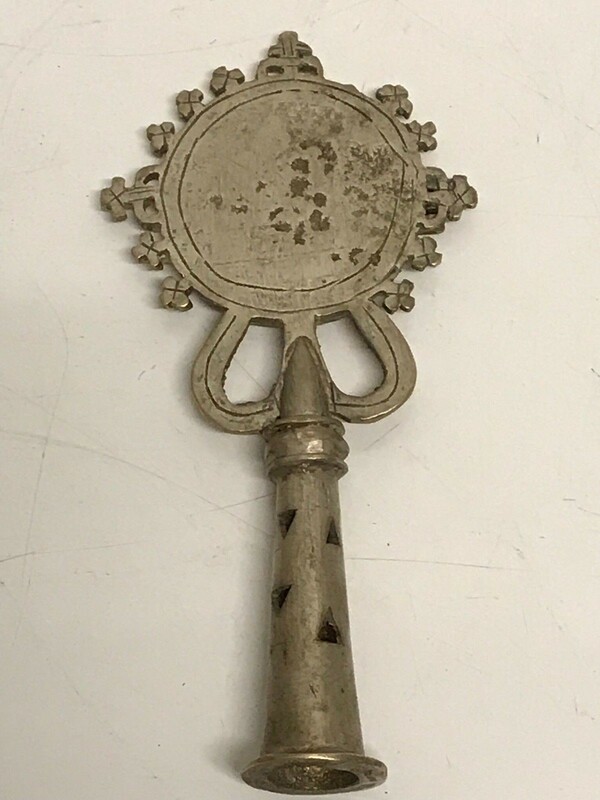 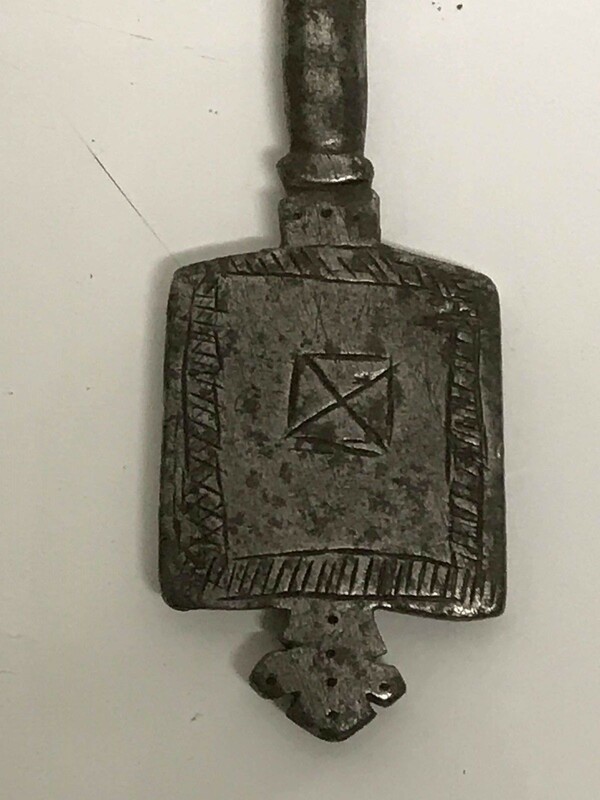 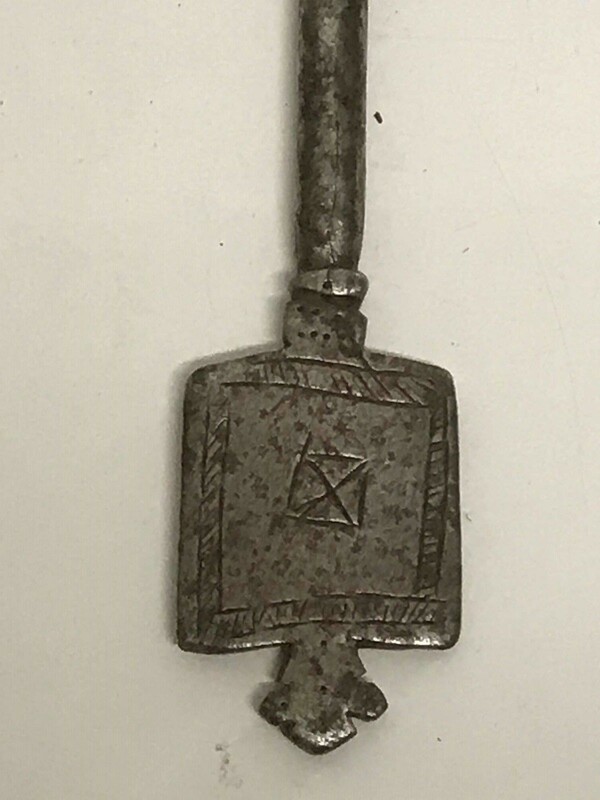 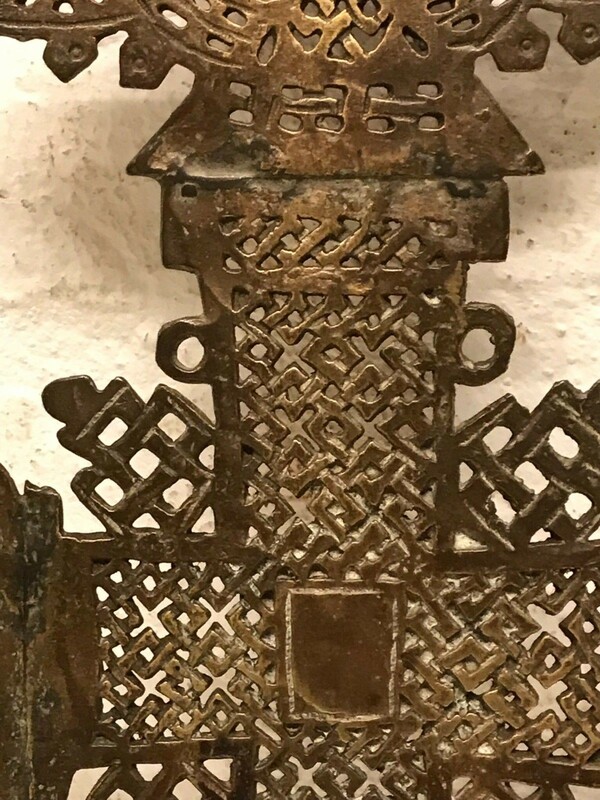 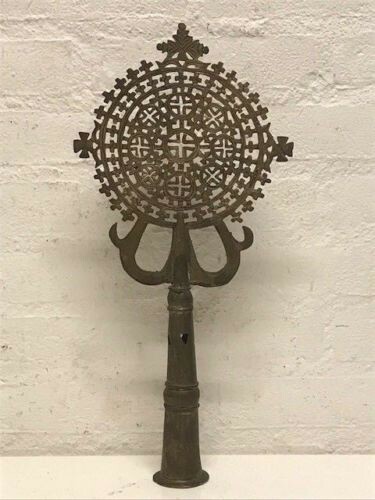 180654 - Large Antique 19th Century Ethiopian Coptic procession Cross. 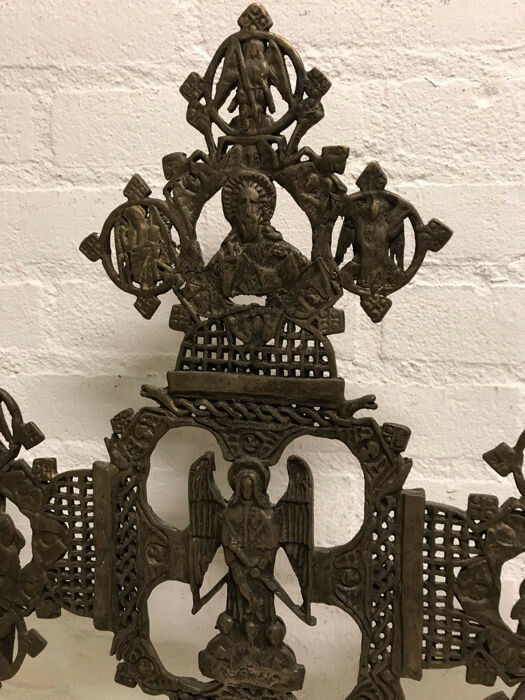 This iron cross measures approximately 51 cm high and is more then 100 years old. 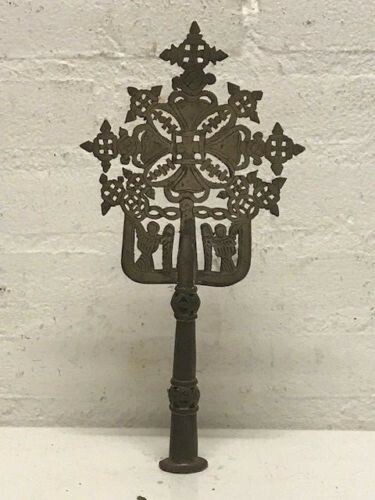 180655 - Antique end 19th Century Ethiopian Coptic procession Cross. 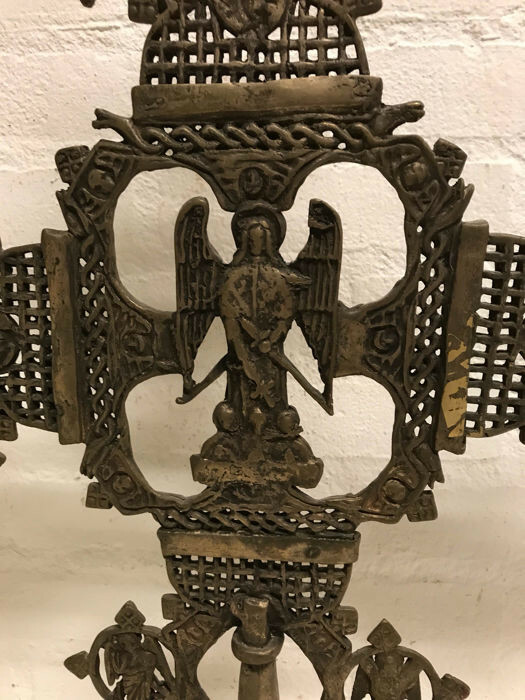 This iron cross measures approximately 41 cm high and is more then 100 years old. 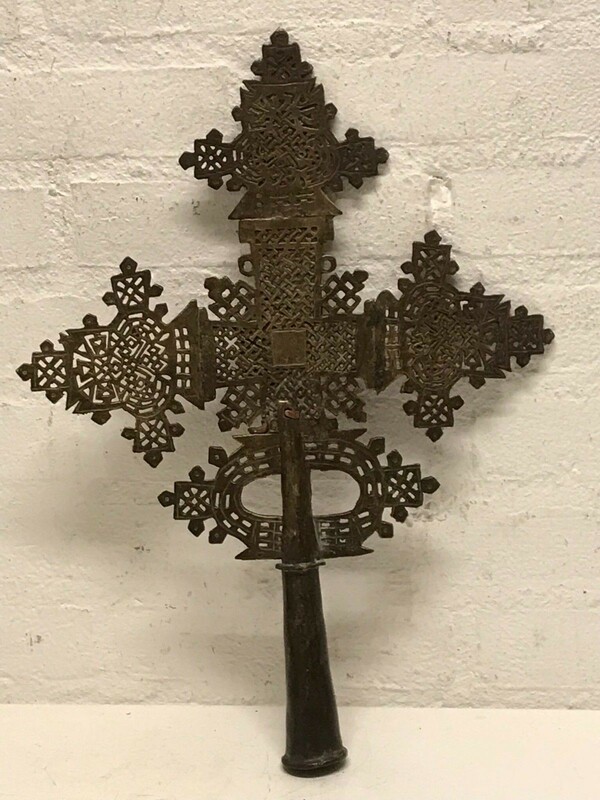 180614 - Antique 18th Century Ethiopian Coptic procession Cross. 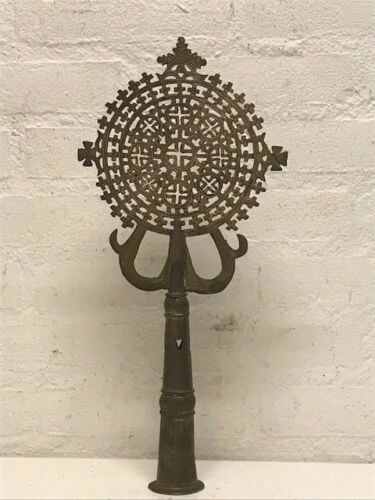 Antique 18th century Ethiopia Coptic Procession Cross from the orthodox coptic Church. 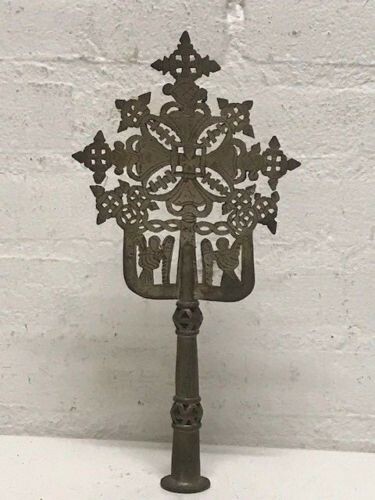 This iron cross measures approximately 20 cm high. 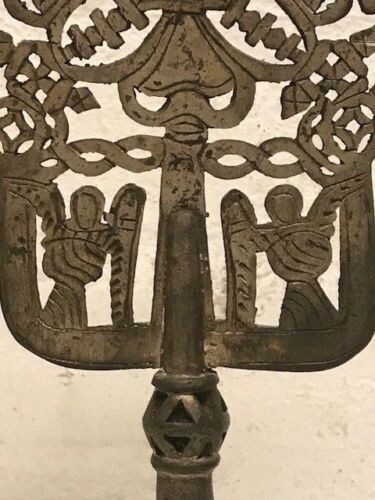 180950 - Antique end 19th Century Ethiopian Coptic procession Cross. 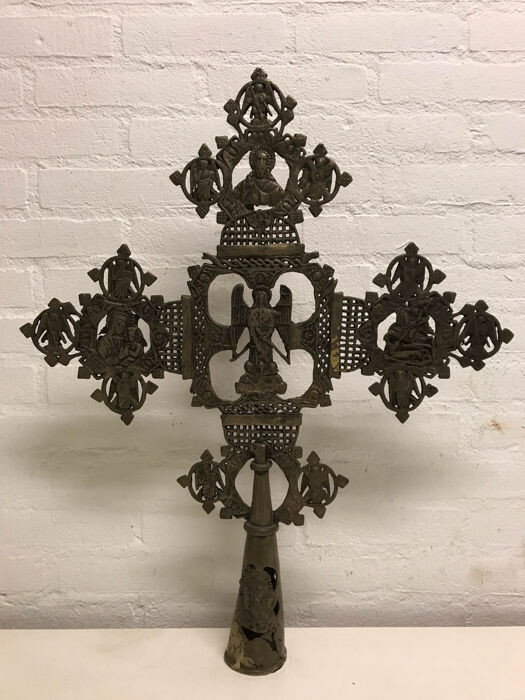 This iron cross measures approximately 41.5 cm high and 31.5 cm wide. 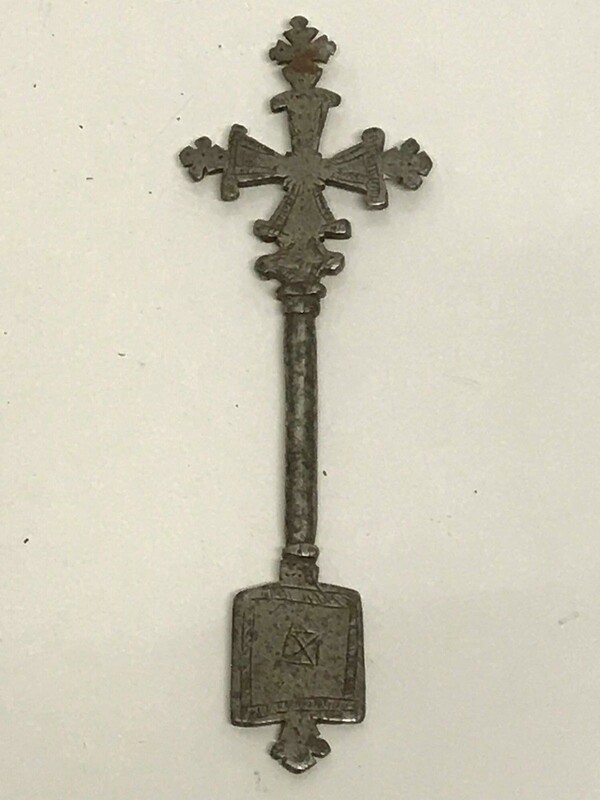 This cross is more then 100 years old. 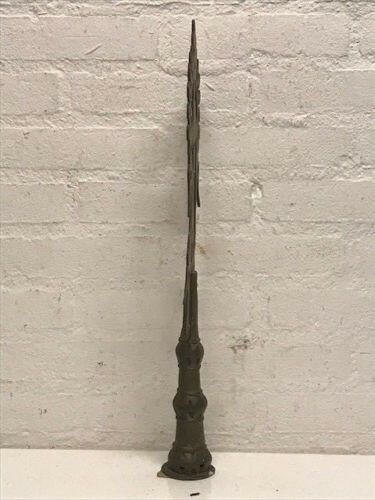 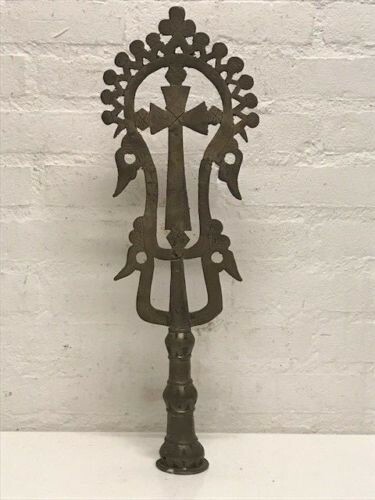 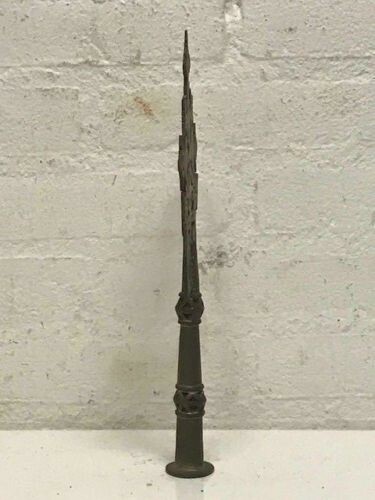 189999 - Large begin 19th century Ethiopian Coptic procession cross - 68 cm. 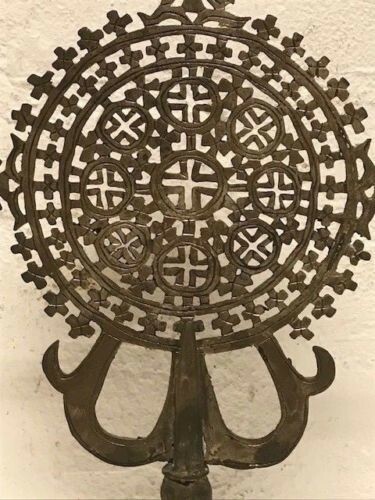 Large Ethiopian Coptic procession cross. 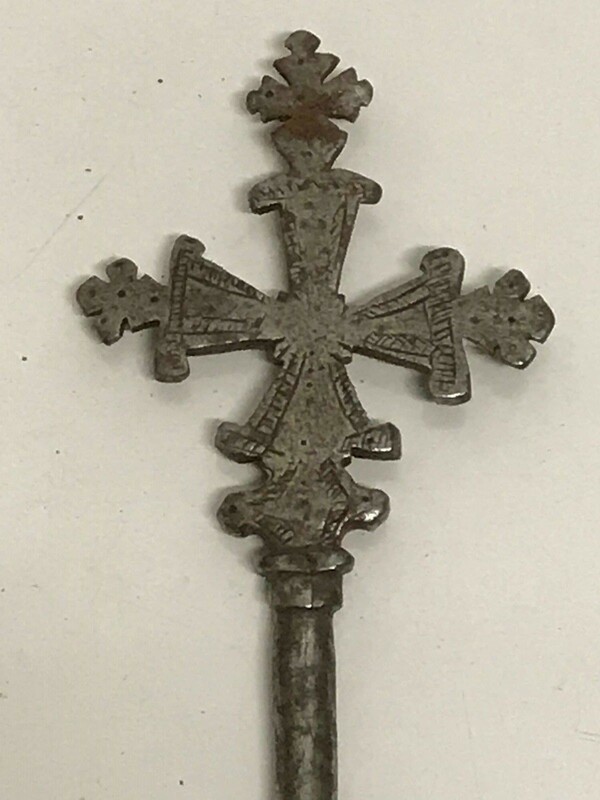 This cross is from about 1800 - 1850 and found near Lalibela. 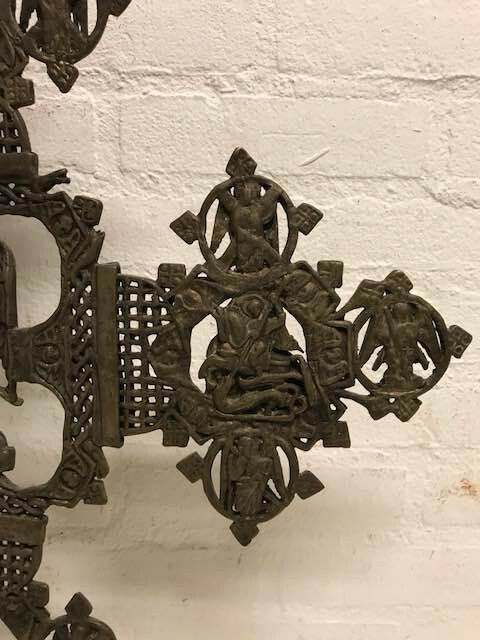 The cross is 68 cm high and 56 cm wide and weighs more than 6 kilos and is made from Brass. 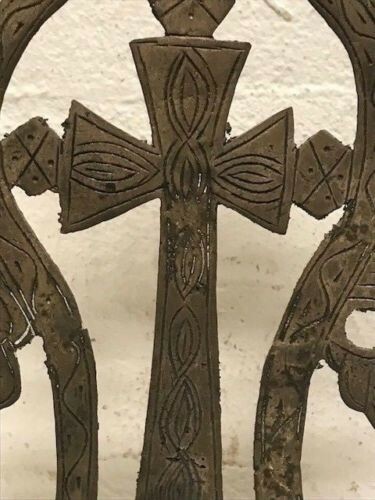 This cross has metal icons on both sides. 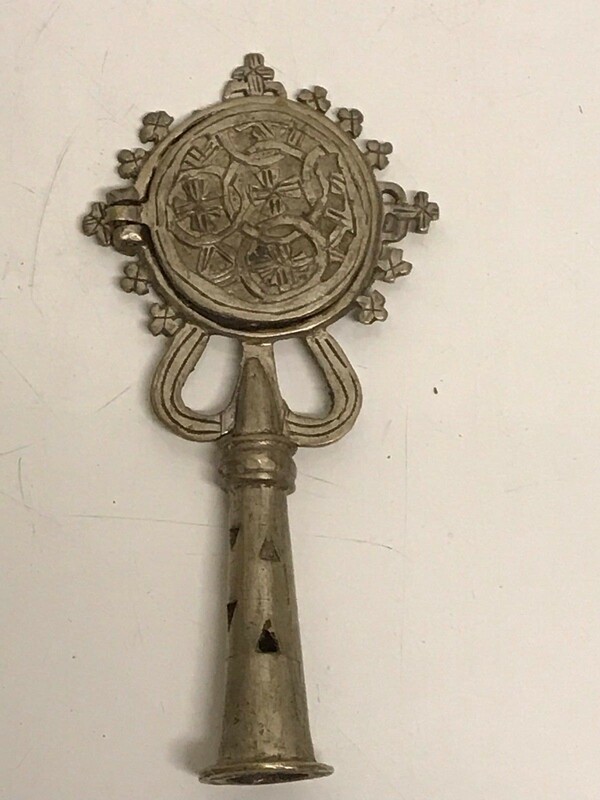 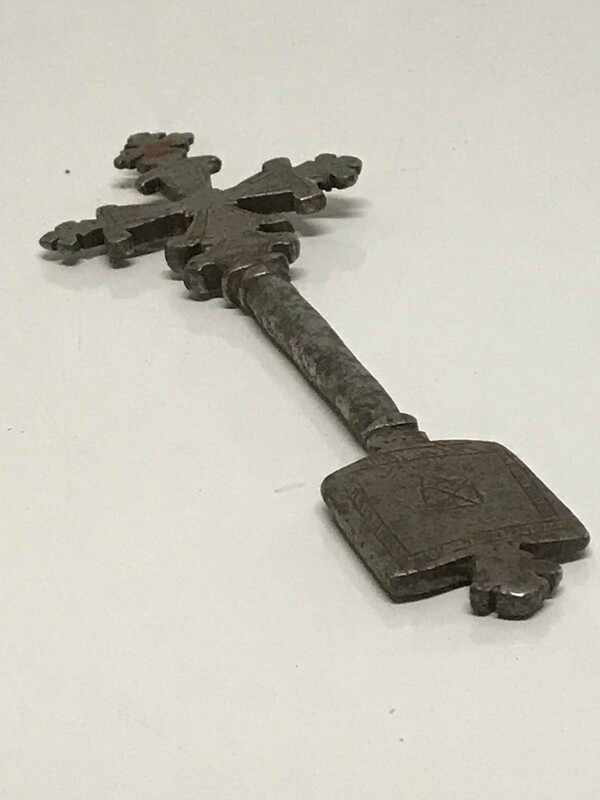 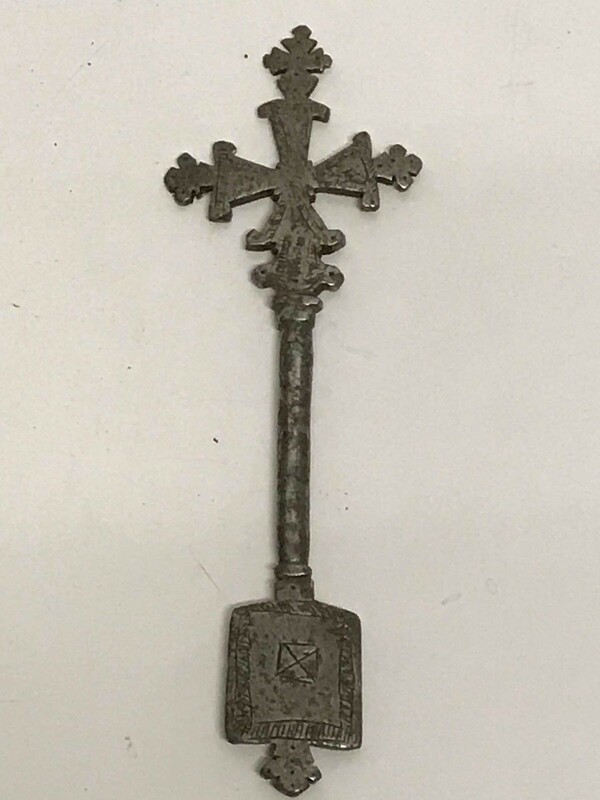 Antique 19th century Ethiopia Coptic Hand Cross from the orthodox coptic Church. 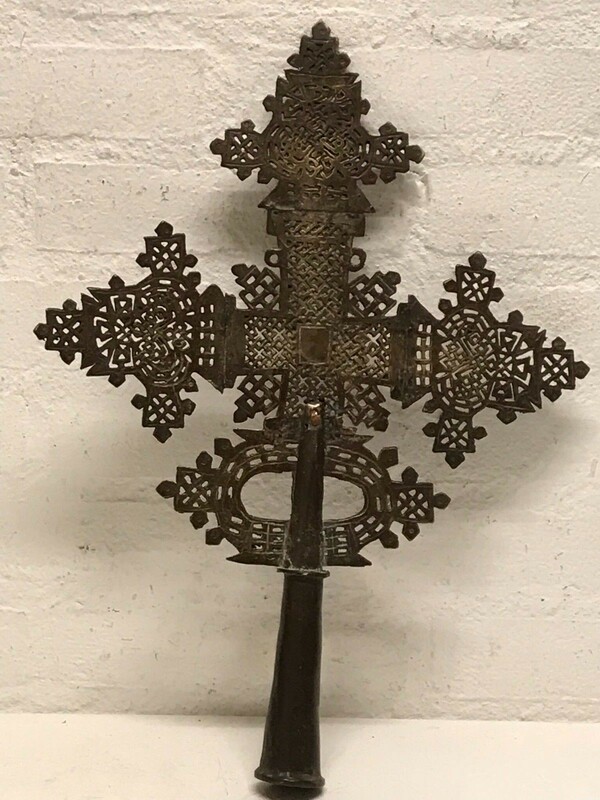 This iron cross measures approximately 20.5 cm high. 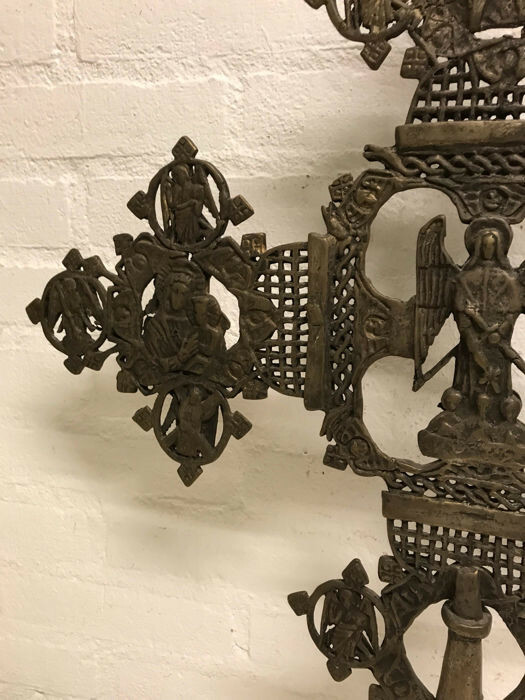 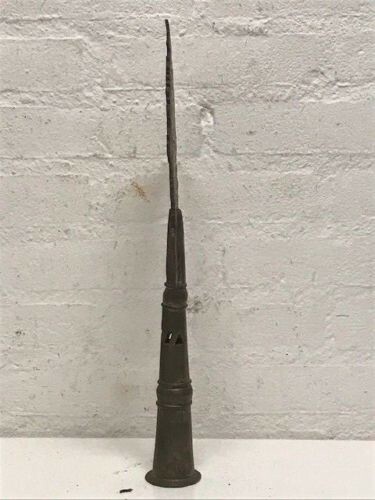 This iron cross measures approximately 21.5 cm high.